Your little one is delicate in so many ways, including that delectably soft, flawless skin. Children of all ages need to take care against the sun, but babies under six months face a double-whammy of not being able to use sunscreen and also not having protective melanins in their skin. In a dermatologist's ideal world, babies' super-sensitive skin wouldn't have any exposure to that great ball of fire, but unless you plan on living in a dark cave, your newbie is likely to catch a few rays. Help keep his or her precious epidermis safe with these tips. The sun emits its most intense ultraviolet and skin-damaging rays between 10 a.m. and 2 p.m. 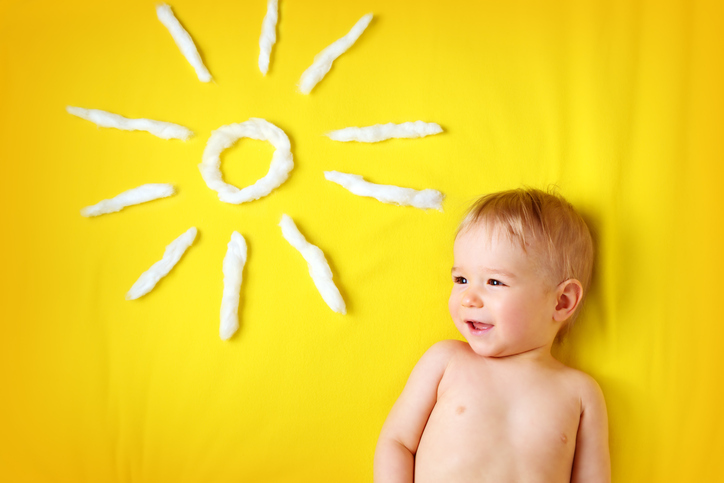 Experts recommend everyone, from newborns to adults, minimize sun time during these hours. The best way to limit baby's exposure to these dangerous rays is to stay inside and out of the sun midday. Babies' eyes are particularly sensitive to the sun. Pick up some baby sunglasses like these Babiators, which provide 100% sun protection against those bright rays. Dress your baby in lightweight (but not see-through) long-sleeved shirts and pants if you're worried about sun exposure. You can also purchase clothes made from a special fabric designed to provide UV protection for an extra dose of sun safety. Taking your little in the pool? Be sure to protect her skin with a rash guard or a full-body swimsuit. Prolonged exposure isn't something any of us needs, let alone a baby with precious skin to protect. No matter how many sun-protective measures you've taken, it's best to keep your time in direct sunlight short. Sun tents with an ultraviolet protection factor (UPF) rating are useful for families who want to enjoy time outside without doing too much damage to their skin. Pitch one like this at the beach or park to keep your baby safe and cool in its shade. Just remember that the sand and water reflect UV rays back up, so don't rely solely on the tent for sun protection. Sunscreen is safe for babies older than six months of age. Choose a broad spectrum formula that protects against both UVA and UVB rays and has a SPF of at least 15; pick a water-resistant sunscreen if you'll be splashing about. Apply it generously 30 minutes before heading outside. For your baby's ultra-sensitive skin, look for sunscreens that contain only inorganic filters such as zinc oxide and titanium dioxide, and avoid those with chemical filters like oxybenzone. For help selecting the right sunscreen for your family, check out these recommendations from the Environmental Working Group's annual sunscreen guide. Floppy hats help protect your little one's exposed scalp, face, and neck from the sun, while having the added bonus of upping the cuteness factor of your baby (did you think it was even possible?). Pick a hat with a generous brim and a chin strap; you might also want to opt for one that has a longer neck flap and built-in SPF protection. Consider purchasing a sun canopy or shield like this one for your car seat and stroller. You could also drape a lightweight blanket over your stroller to block the sun while you're out for a walk. Just be sure your little one is staying cool and getting plenty of fresh air. Think you can skip the sun protection because it's a cloudy day? Think again. About 80% of UV rays come through anyway, so don't leave the hats, sunscreen, and shades behind even if the sun is hiding behind the clouds.